The role of the stay-at-home parent is an incredibly valuable job. Just imagine the cost of hiring someone, an outsider, to perform all the tasks required to efficiently run your household on a daily basis. 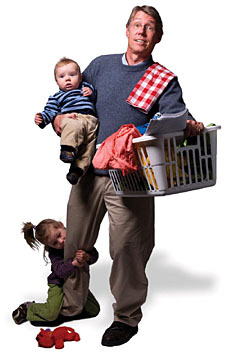 One estimate of the value of the tasks performed by the stay-at-home parent, in 2009 dollars, was over $122,000. If the stay-at-home parent should die or become disabled, the cost of providing care of the household and children will become a huge drain on the earning partner. A personal finance planner is a wonderful asset in helping you make plans to protect yourself and your family from this possibility, with adequate life and disability insurance. What happens if the stay-at-home partner dies or becomes disabled? • If the stay-at-home spouse is disabled or dies, who will take care of the house and kids? • Would the earning spouse want to take time off from work to support a disabled spouse or grieve the loss of a spouse with their children? • There will be the additional costs of childcare, as well as support in other areas such as housekeeping, bill paying, driving kids to school and activities, investing and gardening. The list is nearly endless. Protecting your family and household from disaster is critical. The earning partner should be insured against death or disability; the stay-at-home parent should be as well. • If a spouse is not earning there is nothing to insure or protect – i.e. there is no financial loss if the person dies or is disabled. • The earning spouse could take over running the household and maintain his/her earning power. • Extended family could step in and take over the responsibilities of the stay-at-home parent. Protecting your household from the possible loss of the stay-at-home parent is critical to overcoming the emotional and practical loss of that parent. If you need help deciding how much protection you need, the objective help of a qualified personal finance planner may be just what you need. At Tamarind Financial Planning, we will use our individual financial planning strategies and personal investment management techniques to help you decide exactly how much, and which types, of protection you need.